A couple great photos from one of our fantastic "repeat" customers! 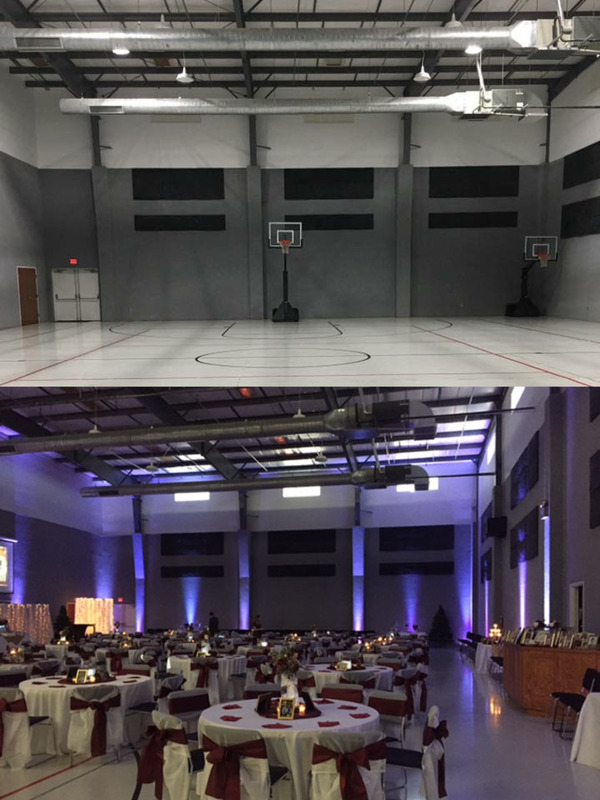 We love the "before and after" showing how some uplighting can really transform the look of a space. Gyms are notoriously hard to decorate. Super high ceilings, bleachers and a basketball court make them a challenge! 20 of our Par 64 RGBA Uplights worked great to help set the tone for a beautiful event! #1 They come in the larger size (par 64) which is going to give off the most light. #3 Despite being a little larger than the other options we carry, they still come in a very slim profile that looks great at your event. #4 They are only $2 more than the cheapest option. So yes, they will cost slightly more to rent but you get a nicer variety of color choices and a brighter light. These lights are also available in a battery powered / wireless version.